Congratulations Team USA! Jordyn Wieber, part of the USA women’s gymnastic team known as the “Fab Five”, beat out China and Russia to win the gold medal in the women’s gymnastics team final in the 2012 London games. U.S.A womens gymnastic team shows left to right Jordyn Wieber, Gabrielle Douglas, McKayla Maroney, Alexandra Raisman and Kyla Ross celebrate with their gold medals during the women's gymnastics team final in the North Greenwich Arena at the London 2012 Olympic Games July 31, 2012. Ryan Lochte won the Gold Medal today in the men’s 400m individual medley upsetting Michael Phelps who came in fourth place. This is Phelps first Olympic loss in eight years. DENVER, Colo. — Former Denver Broncos quarterback, John Elway, and his partners have bought long time auto dealer Mike Shaw’s flagship Chevrolet dealership in Denver, Colorado for an undisclosed amount. Mike Shaw had been named Time Magazine’s dealer of the year. John Elway, a popular motivational speaker at PFP Sports and Celebrity Talent Agency, has bought Mike Shaw's flagship Chevy dealership located on South Colorado Boulevard in Denver Colorado. LOS ANGELES, Calif. — Congratulations to the Los Angeles Kings on their first ever NHL championship winning the Stanley Cup by beating the New Jersey Devils 6-1 Monday night in an electrifying Game 6 of the Stanley Cup finals. Dustin Brown, captain of the Los Angeles Kings, receives the 2012 Stanley Cup on July 11, 2012. PFP Sports & Celebrity Talent Agency recently negotiated an endorsement deal between hockey great Wayne Gretzky and Mobie-Mini, a national self storage container company. 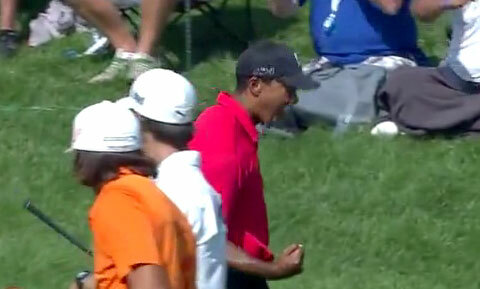 DUBLIN, OH — Tiger Woods is back! He just won the Memorial Tournament 2012 on Sunday, June 3, and tied Jack Nicklaus with 73 PGA tour wins. But it was his gutsy chip shot on the 16th hole that people will talk about for years. Tiger Woods wins Memorial Tournament 2012. Woods makes incredible chip shot on 16th hole. SEATTLE, WA — Congratulations to Phil Humber who threw the first perfect game in the majors in almost two years, leading the Chicago White Sox to a 4-0 victory over the Seattle Mariners on Saturday, April 21. White Sox pitcher Philip Humber talks with MLB Network about what he was feeling going through the final out of his perfect game. Augusta, GA. – Bubba Watson won the Green Jacket on Easter Sunday beating out Louis Oosthuizen in a playoff to win the 2012 Masters, his first career major championship. Watson became the Masters Champion despite the fact that on the same day Louis Oosthuizen of South Africa made only the fourth double eagle in the 76-year history of this major.